Airbus has an ambitious goal for its latest model: winning regulatory approval to fly significantly further from emergency landing strips than any other twin-engine jetliner now on the market. 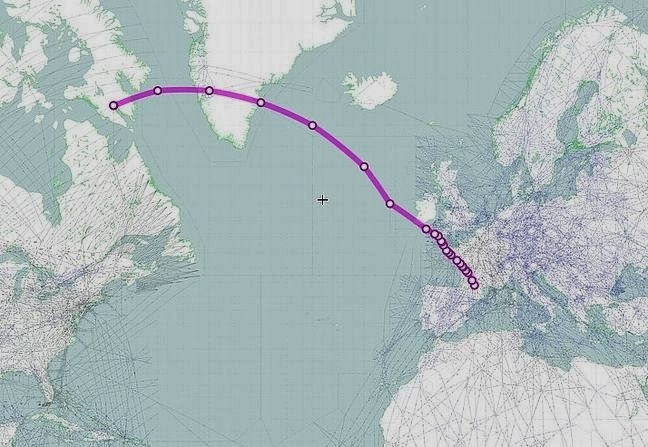 Airbus has told customers and air-safety officials that the A350 is designed to eventually serve super-long-haul overwater or polar routes that take it up to 7 hours away from the nearest diversion airport. That's a 30% longer than the maximum 5 ½-hour limit for current twin-engine Airbus A330s and Boeing777 aircraft. The proposed change means that in the event of an A350 en route emergency, reaching a runway could require the equivalent of a north Atlantic crossing from New York to London on a single engine. In addition to engine reliability, such a 420-minute diversion limit also requires demonstrating improved dependability or enhancements to electrical supply, fire suppression and other systems. 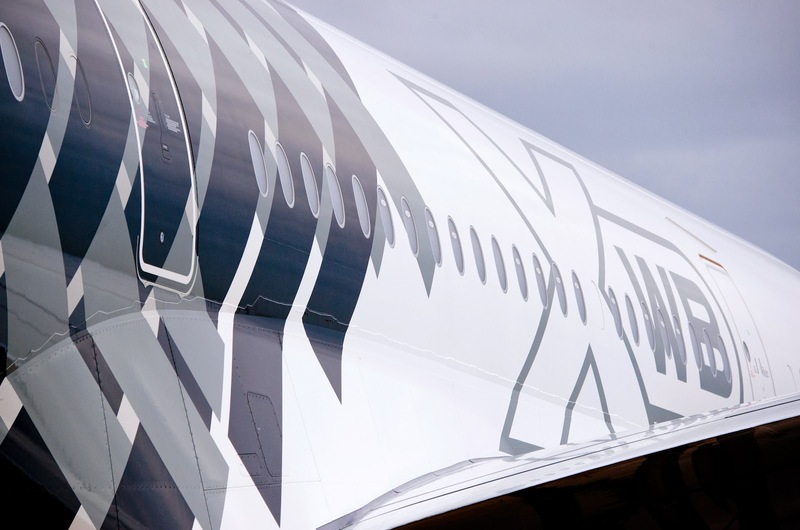 That would open up some new, nonstop routes for twinjets, such as Australia to Brazil or New Zealand to South Africa probably later this decade, according to industry officials, while giving Airbus a public-relations and marketing edge over its U.S. rival. Boeing's 787s currently must stay within 180 minutes of emergency strips, and there's no indication that restriction is likely to be eased quickly. 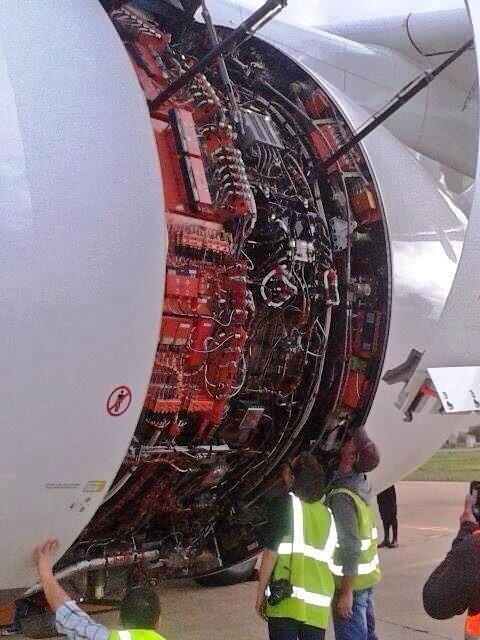 One reason is continuing concerns about the 787's cutting-edge lithium batteries. 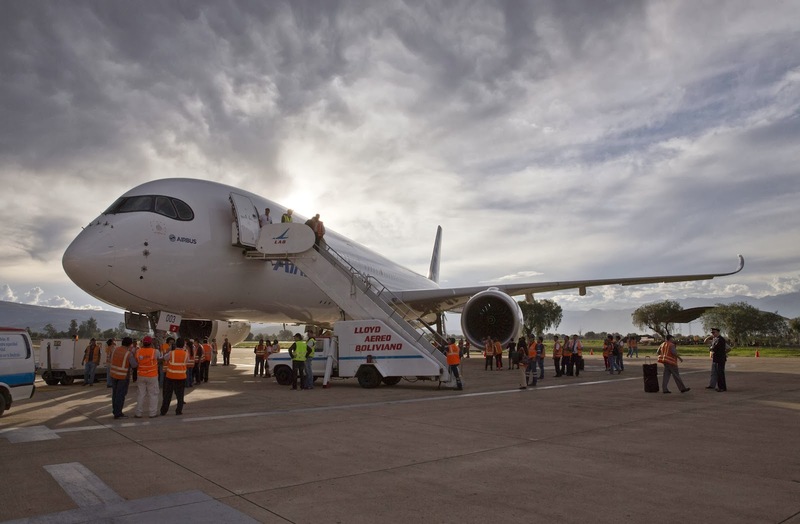 The 787's high-profile battery problems, which caused the fleet to be temporarily grounded last year, have made Airbus officials and the rest of the industry leery of predicting expanded diversion times as soon as new models are introduced. 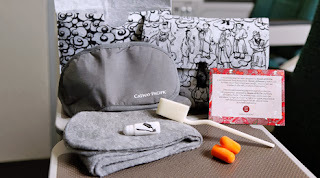 Longer permitted diversion times generally allow for more direct routes and also mean airlines can save time and fuel during periods when bad weather or other factors make certain emergency strips unavailable. 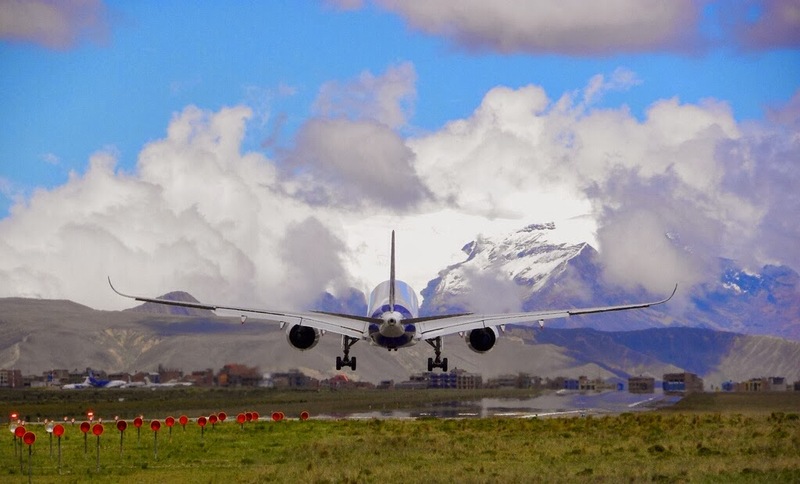 In case of an engine problem, cabin depressurization or other emergency requiring an A350 to fly at lower than normal altitudes, for example, cockpit computers will provide pilots with optimum and safe descent profiles including escape routes through mountainous terrain. 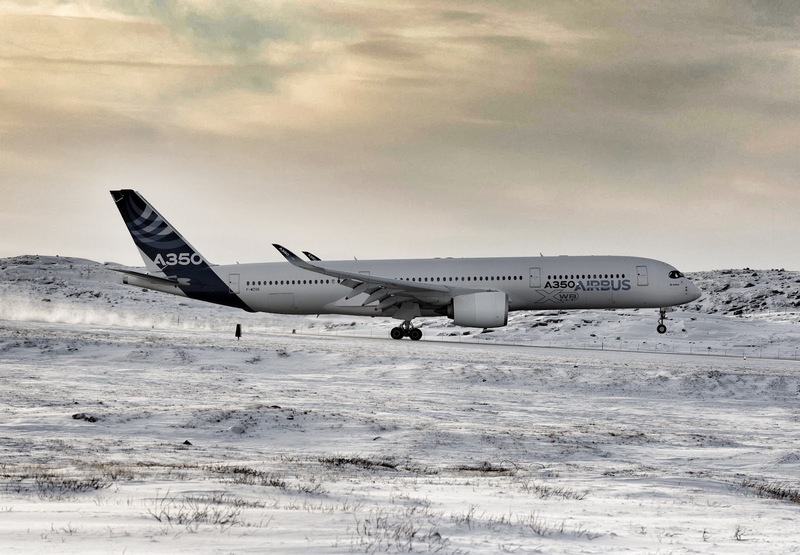 Airbus’ A350 XWB MSN3 development aircraft with a team of 48 Airbus specialists has completed cold weather trials at Iqaluit, Canada. Temperatures reached down to -28°C. The scope of the trials included: APU and engine starts after cold soak; verifying system behaviour; low-speed taxi and rejected take-offs. It also performed a local flight as planned. 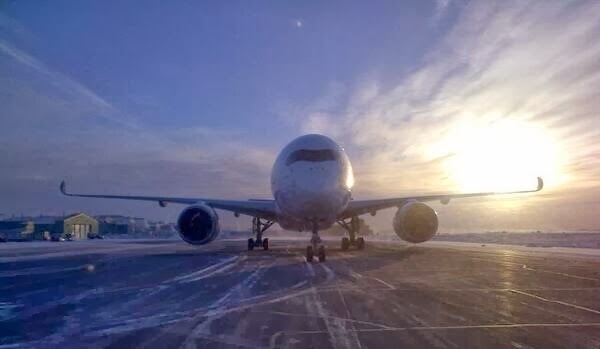 A crew from Airbus cut short their intended 5-day visit the A350-900, on 26/Jan, when temperatures hit a balmy -18 C.
That was more than 7 degrees too warm to continue any further, and the crew of 48 engineers, mechanics and test pilots had to pack up and return to base in Toulouse, France. “If we stay one night we’re going to lose time,” flight operations manager Pedro Dias said at the start of an unseasonably mild Sunday afternoon. Warnings of an incoming blizzard (wind speed more than 125km/h), expected to hit Iqaluit in the next 12 hours, were not the deciding factor, Dias said. Flight test engineers decided all mission objectives were covered by day three of the mission, after two full days of work at ideal temperatures measuring -25 and below. “Things must have gone really well,” said Juan Solano of Honeywell, the principal project engineer for the plane’s air conditioning systems. 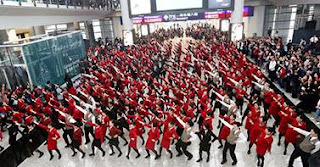 With that, the international crew gathered boxes and bag loads of equipment and personal effects at the airport’s forward base operation facility in the afternoon, and reloaded the plane for departure. 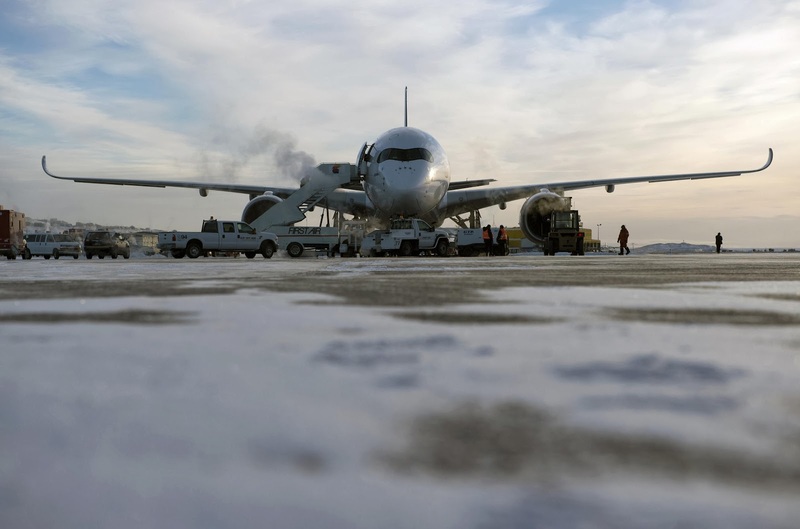 And off they went, Europe-bound, at around 5:00 p.m.
Based on the press release "A350 XWB MSN3 completes cold weather testing in Iqaluit Canada" and on the article " Airbus crams Iqaluit cold-weather tests into one short weekend" published in Nunatsiaq online. 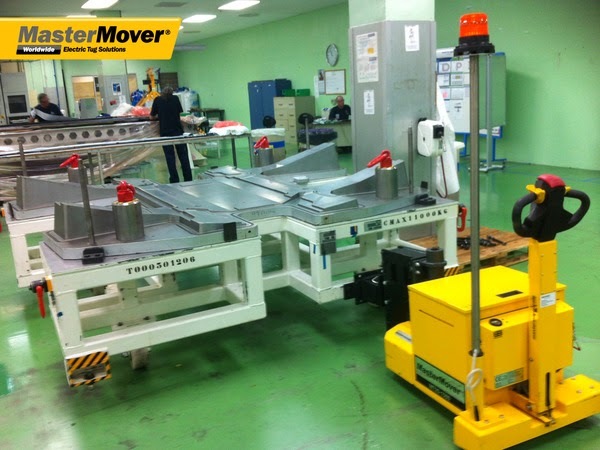 How a single pedestrian operator can move heavy components in the A350 XWB manufacturing and assembly process? 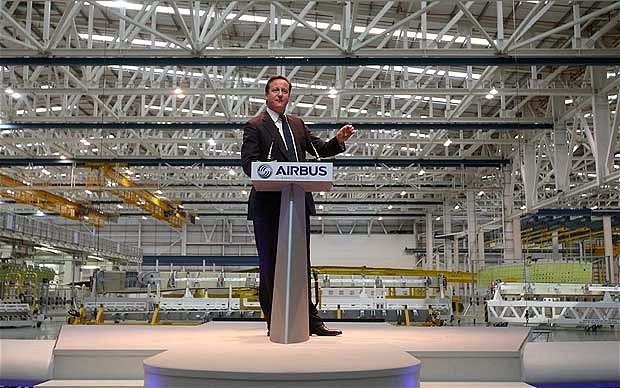 Wing assembly plant in Broughton is responsible for manufacturing the wings on nearly all Airbus aircraft, from the company’s popular A320 to the A350 XWB. The complex manufacturing and assembly process involved in building a wing requires the fast, safe and effective transportation of components and tooling around the factory. 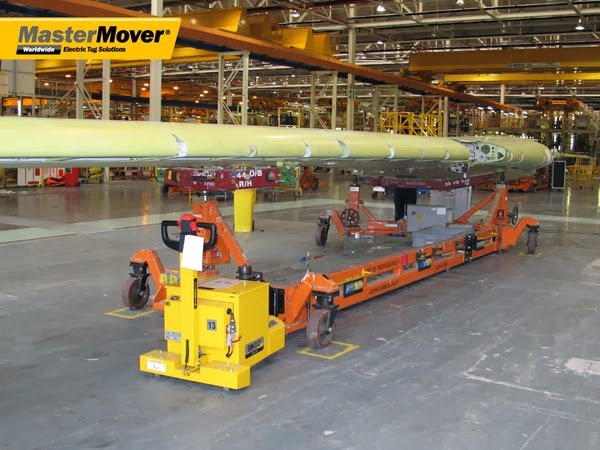 MasterMover has supplied models from its MasterTug range as a solution for moving everything from stringers through to complete wings for the A320. As demands on the Broughton operation have grown, so has the role for the MasterTug. Today, the tugs can be found not only moving wing parts but also moving support equipment, including mobile working platforms, production tooling, kitting trolleys and test equipment. 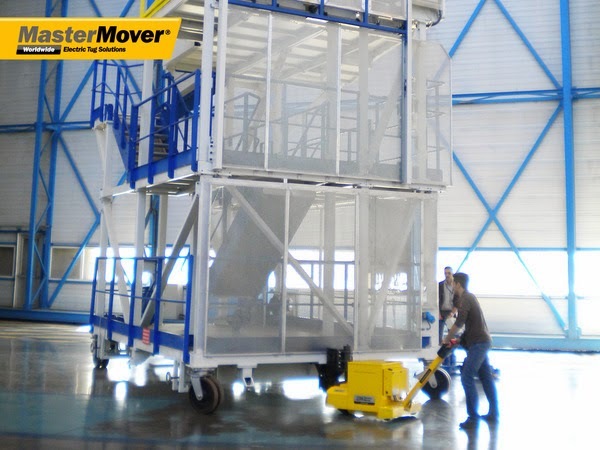 Designed and manufactured by MasterMover using the principle of weight transfer, electric tugs enable a single pedestrian operator to move heavy components (from 4Tn to 15Tn) with relatively small equipment by generating tractive force from the load itself. As components can be moved in a safe and controlled manner without the need for forklifts or cranes, Airbus is able to organize its assembly layout to suit its specific working practices. 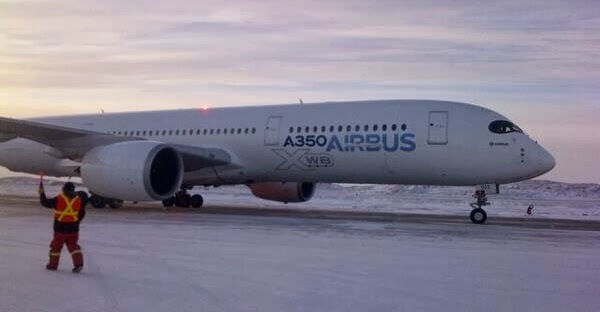 The Airbus A350 MSN3 prototype will spend around 5 days in temperatures as low as -30 degrees Celsius to prove full functionality of its systems under extreme weather conditions. 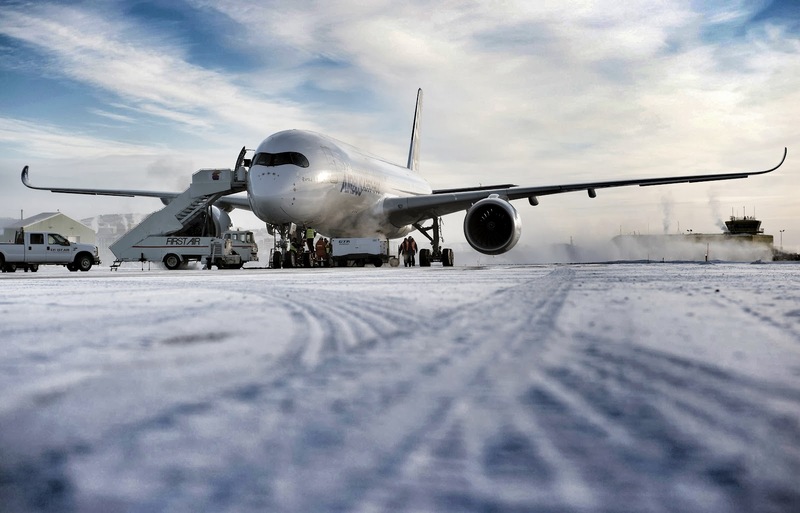 Test campaign includes aircraft de-icing, engine start-up and landing gear operations tests in the freezing environment. 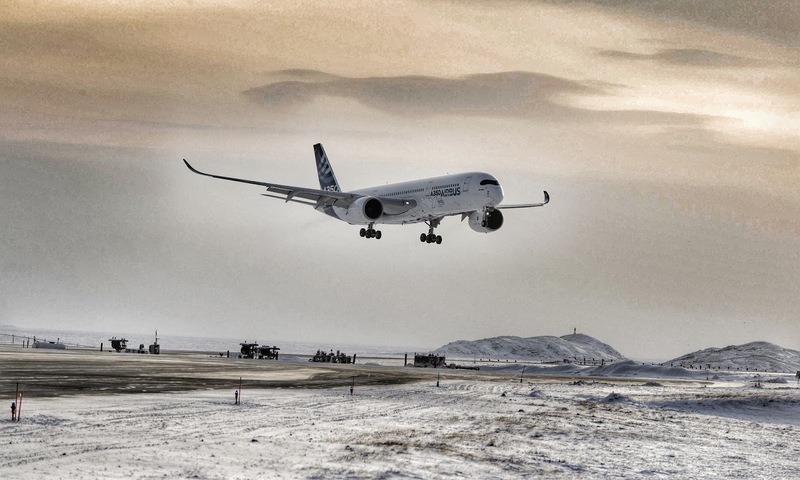 The A350 engine manufactured by Rolls-Royce was previuosly tested in the same site -northern Canada at Iqaluit- during the certification test campaign developed for Trent-XWB. 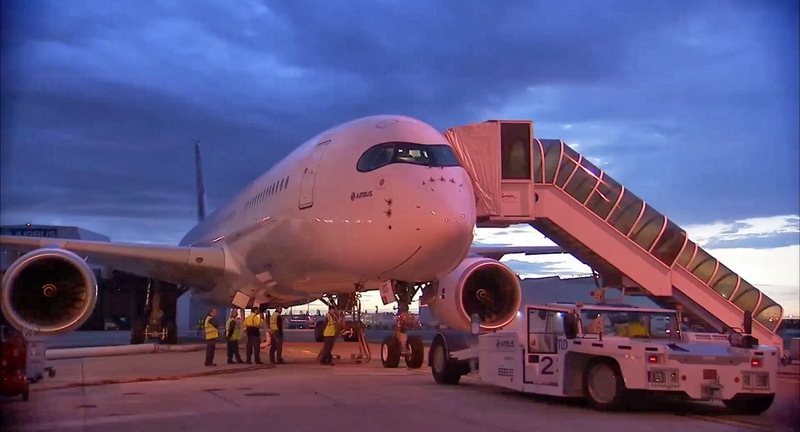 Airbus’s second flight-test A350 aircraft departed Toulouse on a transatlantic sortie to Canada on Friday. Based on the article "A350 heads to Canada for cold-weather tests" published in Flight International. 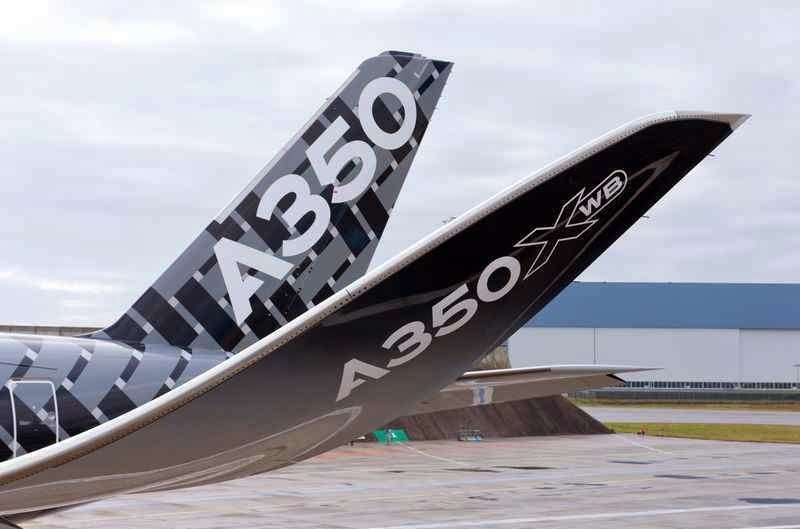 Singapore Airshow will get the A350's full debut on the ground and in the air display. Airbus will present the A350 XWB at the Singapore Airshow in February, marking the first full display of the aircraft at an international air show. The flight test aircraft participating in Singapore will be MSN 003, which will be on static display 11th – 12th February and will also take part in the flying display on both days. This prototype is the same that has been in Bolivia and Martinique last week and will spend this week in Canada. The aircraft’s participation at Singapore will enable visitors to get a close-up look at the aircraft both on the ground and in the air, with a flying display that will demonstrate its manoeuvrability, sleek design and exceptionally low noise levels. 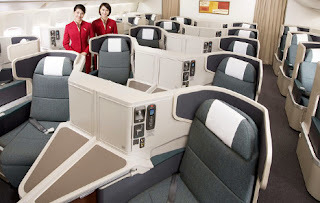 Carriers from the region that have already ordered the aircraft include AirAsia X, Air China, Asiana Airlines, Cathay Pacific Airways, China Airlines, Hong Kong Airlines, Japan Airlines, Singapore Airlines, SriLankan Airlines, Thai Airways International and Vietnam Airlines. To date, firm orders from the region for the aircraft already total 244, representing 30% of total A350 XWB sales. The A350-800 is too small and it has more range than required by most of the market. Larger A350-800 to be considered. Airbus is quietly moving away from the current design of the A350-800 and is considering changes that would make the aircraft larger and likely more economical to operate. 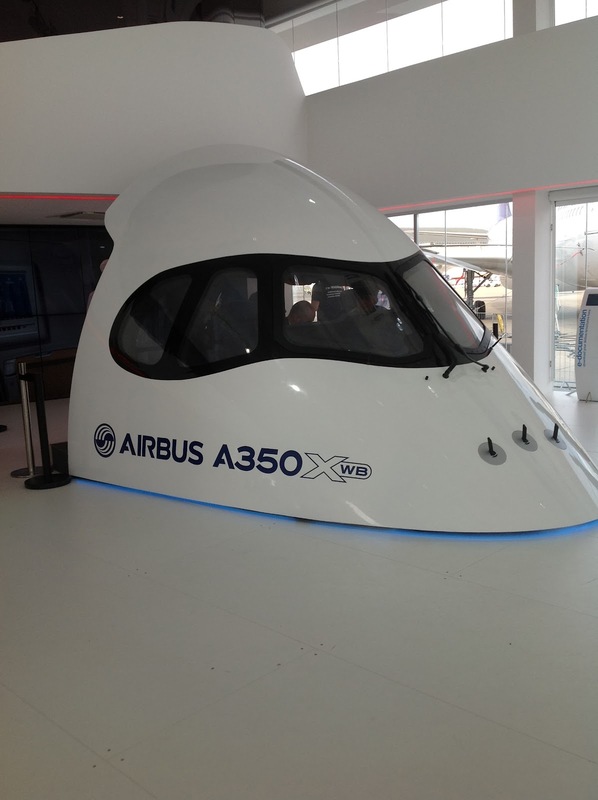 Many in the industry have doubted that Airbus will ever build the -800. If the plans are firmed up, the aircraft maker will not build the currently conceived version, but a yet-to-be fully defined aircraft. Leahy argues that “we are production constrained until beyond 2020” and Airbus wants to use the available slots for the larger versions, which are generating higher revenues. However, since the last of several fundamental design changes in the A350 program, the -800 has become a shrunken version of the -900, at a size that is not economically optimal. The aircraft also has more range than required by most of the market. Some of its disadvantages could be addressed by shrinking the -800 less. Airbus is not saying when the current version of the -800 would be available, but Leahy wants to deliver the -1000 before the -800. The -1000 is to enter service in 2017. The -800, as currently planned, has space for 276 passengers in typical three class layout. It is 60.54m long and has a range of 8,250 nm. By comparison, the A350-900 is 6.3m longer and seats 315 passengers. The baseline A350 has a range of 7,750 nm, according to Airbus. Leahy makes clear that even if changes are decided, Airbus will not go for an all-new design of the -800 and that it will still be a shrunken version of the -900. The redesigned -800 would likely move close to just under 300 seats while its range would be below the current target, but still above the -900, if no other changes are incorporated. Leahy says that since talks with customers are continuing it has not yet been decided how many rows of seats would be added. 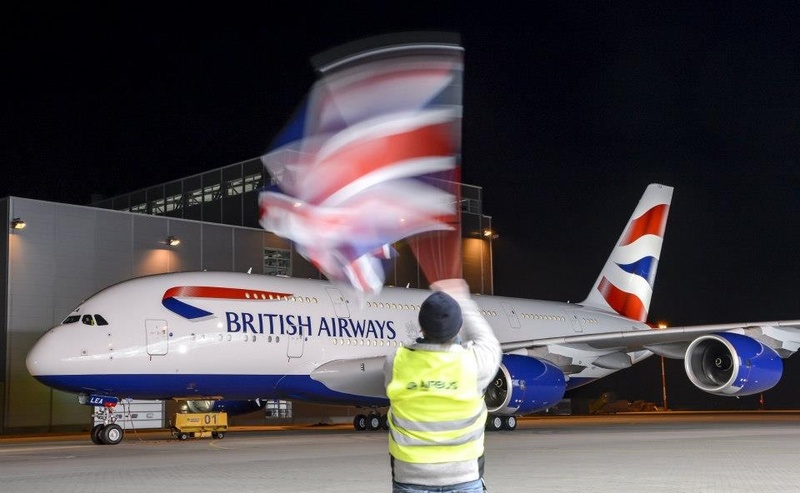 Airbus thanks the British government´s support … while there is no news from the “new” German government concerning the pending payment of a loan of 623 million € for the A350 XWB development. 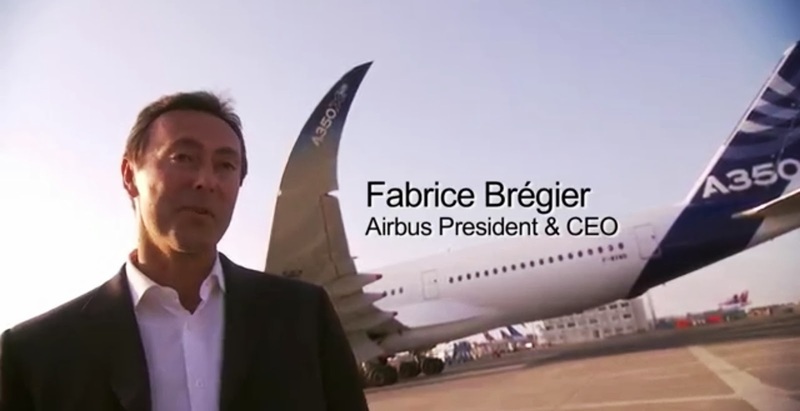 The French president of Airbus, Fabrice Brégier has only praise for the British government’s support of the aviation industry. 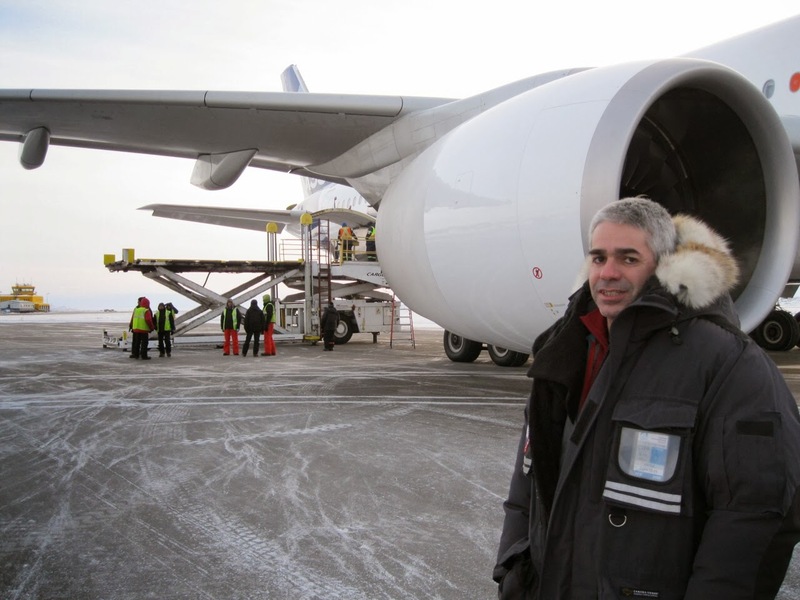 While the first delivery is on schedule, Brégier maintains a hint of caution and says 2014 will be a “very big challenge” and a “very intense year for the program”. The president and chief executive of Airbus, Fabrice Brégier actually goes one step further and hails the British government’s support of industry. 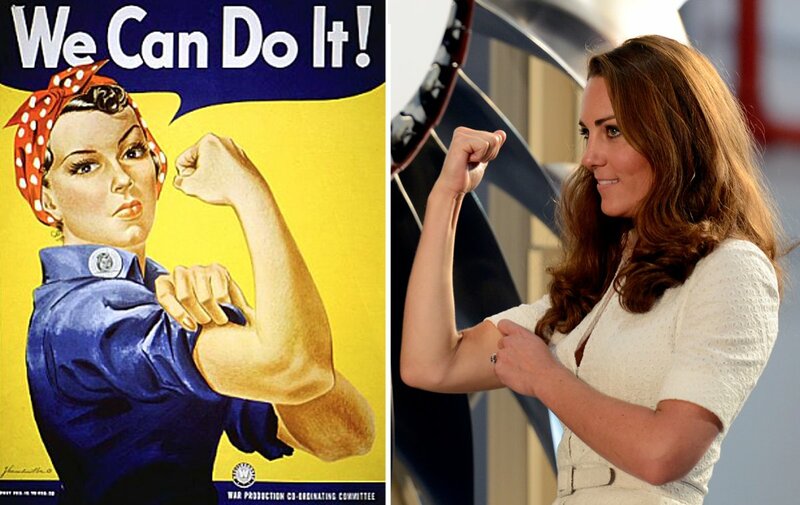 “I must say the UK has an approach which is to support industry, to support the economy and to be very pragmatic,” he said. 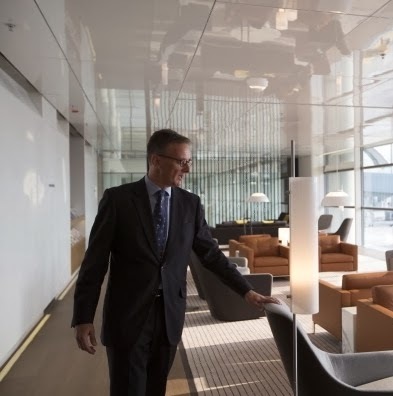 “The transformation of our company into a simpler, more agile and faster one is clearly taking shape,” Brégier said. 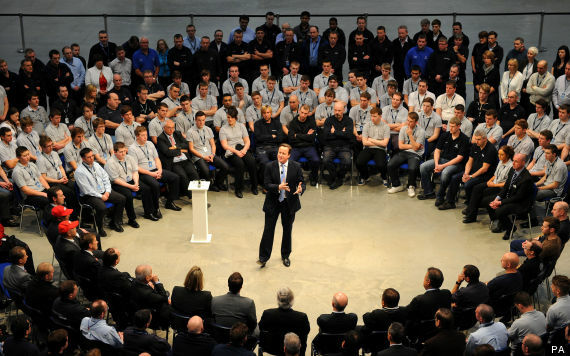 Airbus is an important employer in the UK; Airbus employs 6,000 people at its factory at Broughton in North Wales and 4,000 people at Filton, near Bristol. 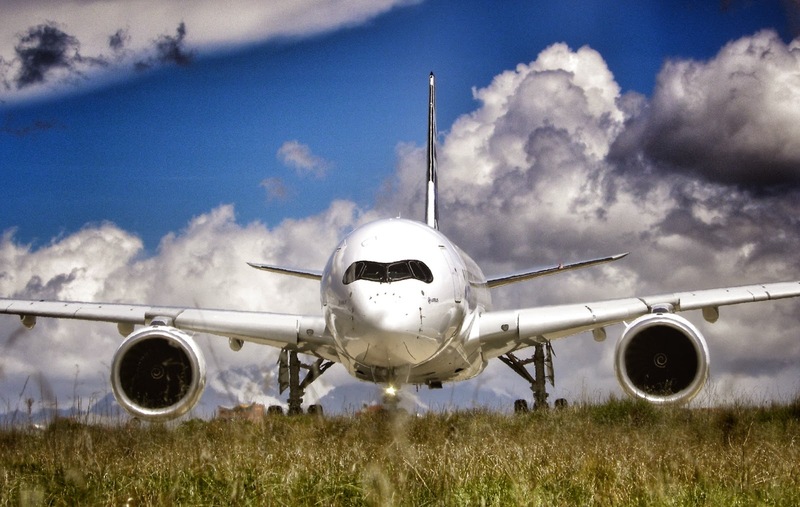 As well as using the cash on its balance sheet to expand its fleet on offer, Airbus is also a key player in investing and developing the aerospace industry and it works closely with the Government in the UK to do this. Brégier explains that the British government “brings very good support to innovation”, in particular noting the Aerospace Technology Institute (ATI), which he describes as a “recipe for future success”. 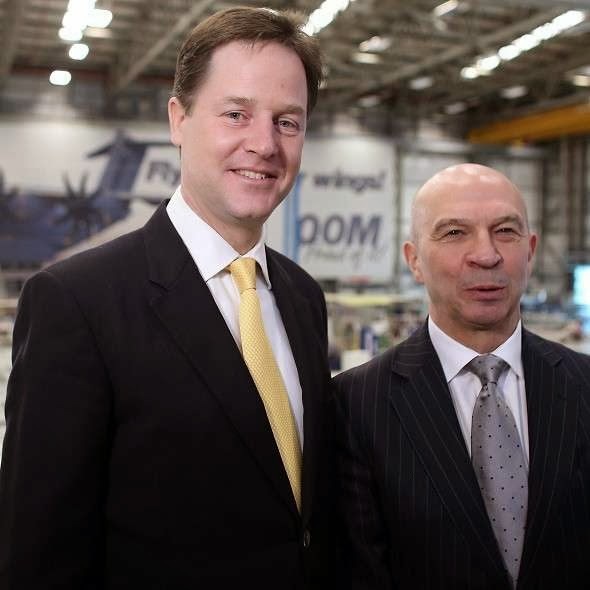 The ATI was a key outcome of an unprecedented £2bn, 7-year investment program into UK aerospace, announced by Nick Clegg, the deputy Prime Minister, last August. The money is provided equally by the industry and the Government. 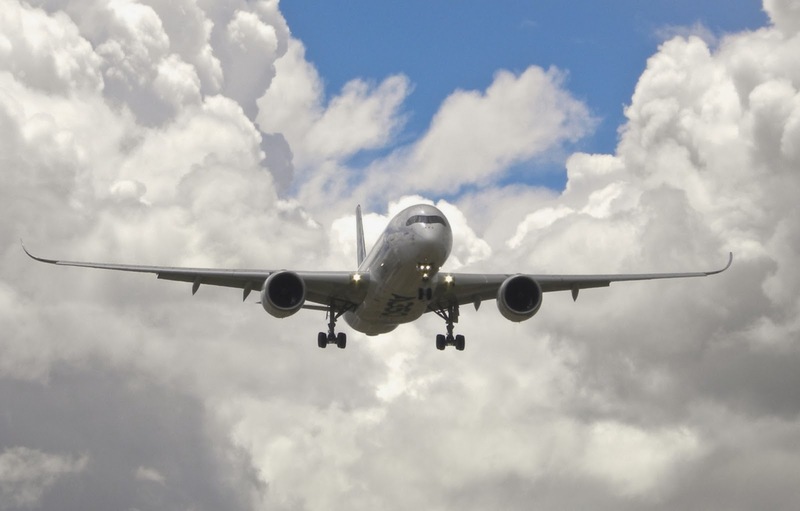 Last December, it opened a £70m state-of-the-art Airbus Aerospace Park at Filton, which focuses on design and manufacturing, as well as support roles such as finance and customer services. The 700-acre Broughton site, where the wings for all Airbus planes are manufactured, including the ones of the A350, has also been heavily invested in, with nearly £2bn spent on the Welsh facility over the past decade. The UK is just one of the 4 countries where Airbus has a manufacturing base, the others being Germany, France and Spain. “One of Airbus’s greatest strengths is the partnership we have from our 4 home countries and other partners in Europe – and the UK is a key part of this partnership,” he says. What he wants to focus on, he says, is winning the “battle of competitiveness in Europe against the rest of the world”. 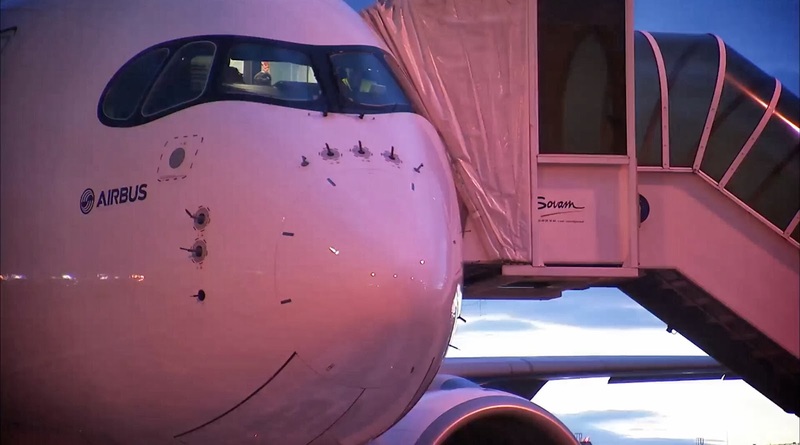 “This battle is very tough, in particular with Boeing,” he explains. 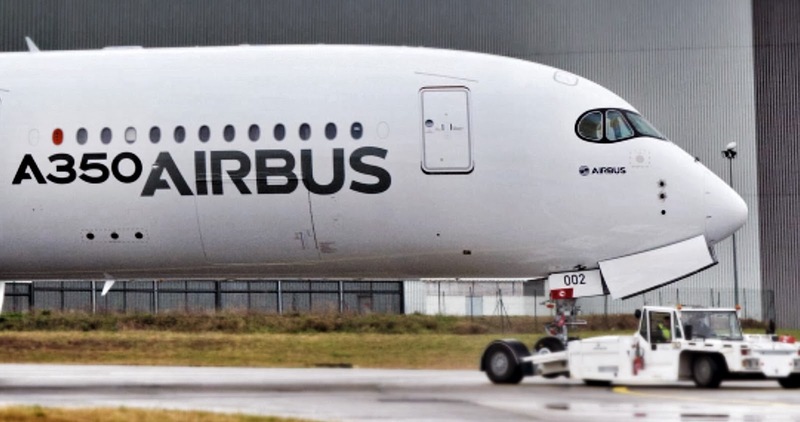 Meanwhile there is no news from the German government concerning the pending payment of a loan of 623 million € for the A350 XWB development that was discussed one year ago and the French government has lowered its Airbus shares by 1% with 451 million-euro sale. 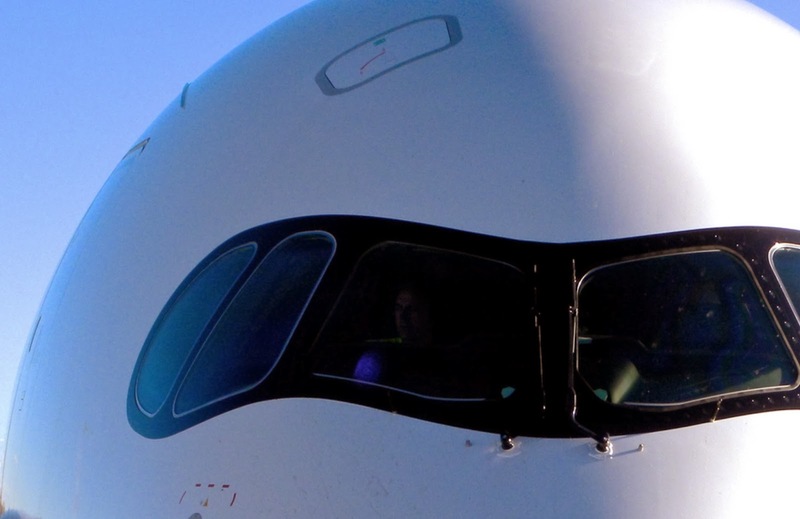 Airbus studies higher A350 monthly-rate deliveries. 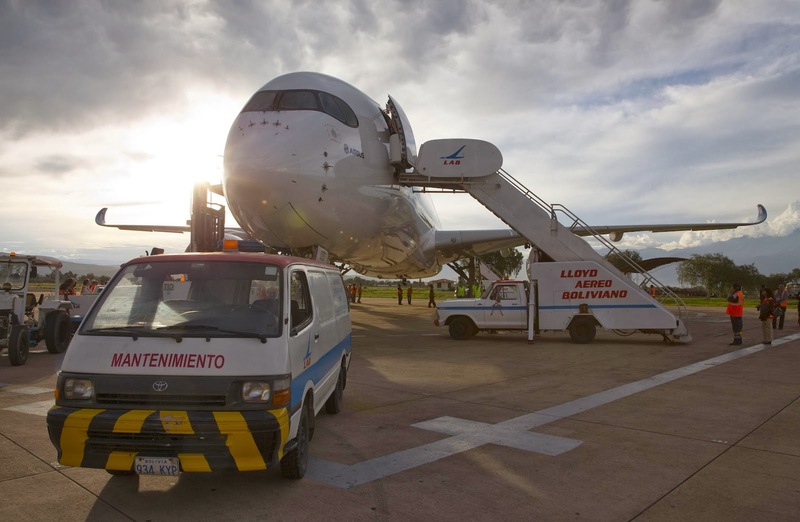 “The market would easily justify over 14 a month on the A350,” Leahy said. Airbus is exploring higher output of A350 wide-body aircraft, following a similar move by Boeing to help shorten the wait time for customers following its highest order intake ever last year. The 10-a-month rate targeted for A350s in 2018 could go to 14 thereafter, as per information from Airbus mentioned by Bloomberg. Airbus and Boeing, the biggest makers of commercial jetliners, have order books stretching out years, making it harder for some customers to upgrade their fleets with more fuel-efficient aircraft like the composite-material A350. Airbus’s net order intake last year was 1,503, topping the 1,355 for Boeing, which kept the crown for the deliveries tally. 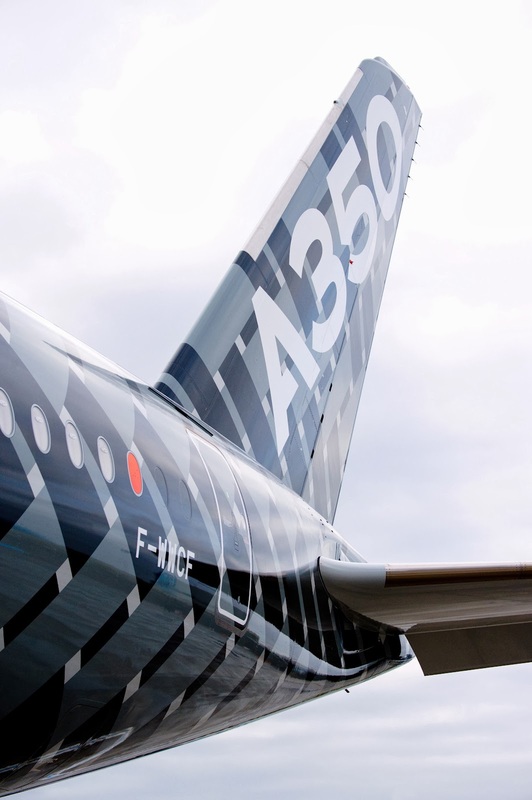 Output will increase further in 2015 as A350 production ramps up and again in 2016 if Airbus decides to increase A320 build-rates, Tom Williams, Airbus EVP for programs said. 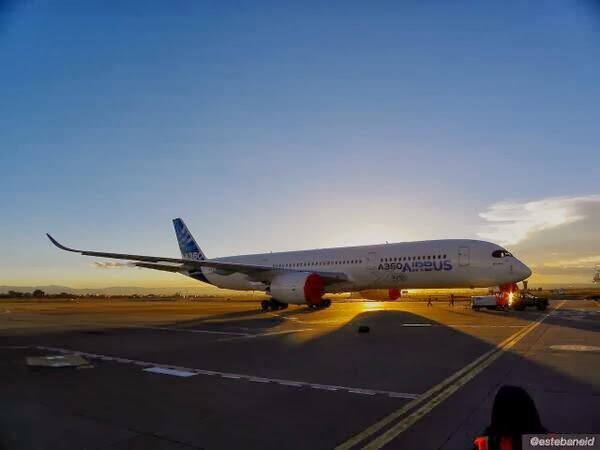 With Boeing boosting output of 787 Dreamliners to 14 a month by decade’s end, Airbus is considering keeping pace with its A350, which is now undertaking test flights. Airbus is sticking to its goal of delivering at least one A350 before year-end, according to Bregier. 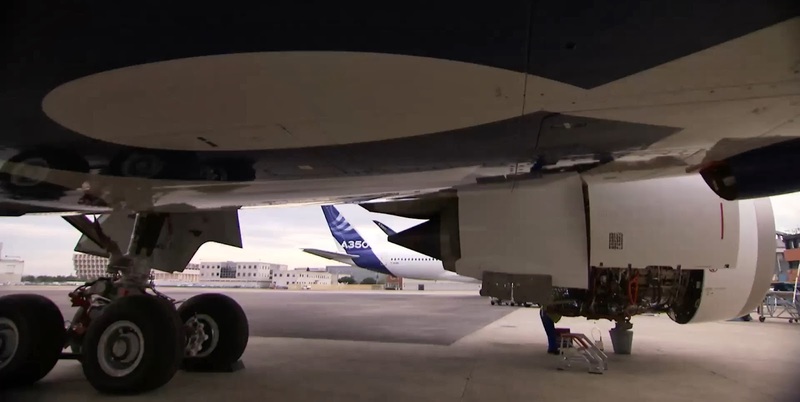 “The market would easily justify over 14 a month on the A350,” Leahy said. Airbus’s success so far in keeping the A350 on schedule contributed to last year’s 88%increase in the value of the parent company shares. 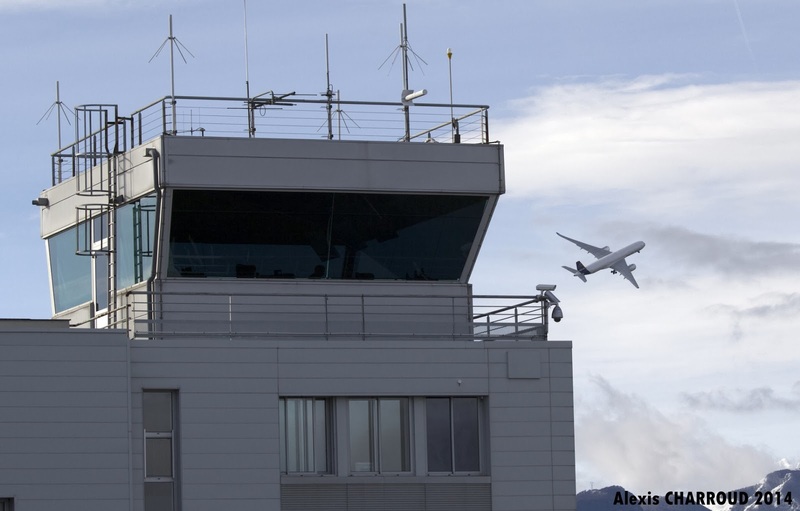 Airbus Group, formerly called EADS, now has a market of 43 billion euros ($59 billion). 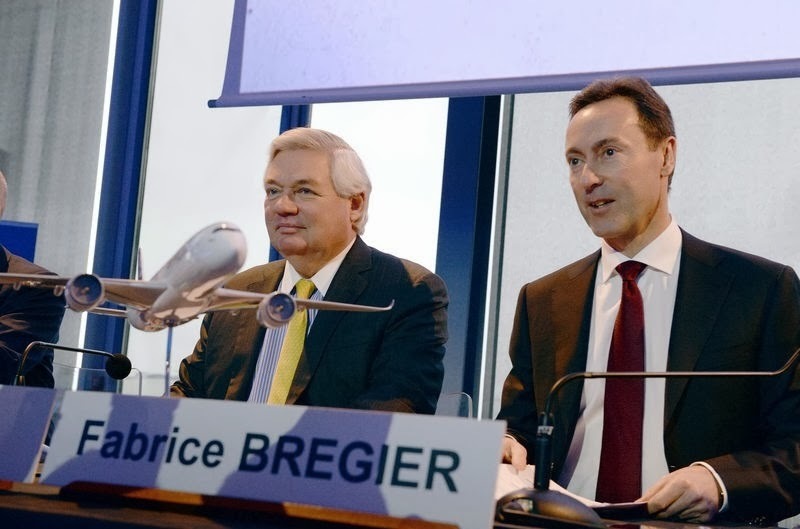 “The risks on the A350 are coming down each day,” Bregier said. Airbus to decide which aircraft is better to counter the 787 in the 250- to 300-seat sector; A330-300, A330 Neo or A350-800. 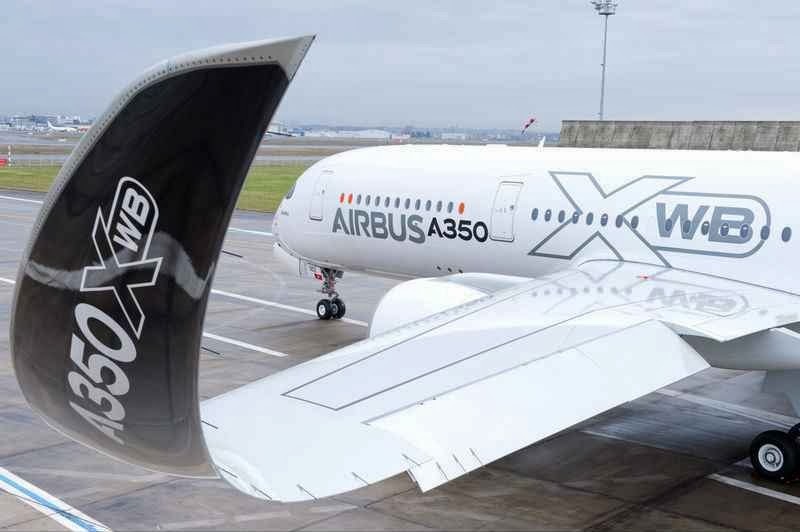 The crucial 250- to 300-seat sector is currently being addressed by the A330-300, and COO-Customers Leahy revealed some weeks ago that Airbus is looking at potential modification to the A350-800’s baseline specification. 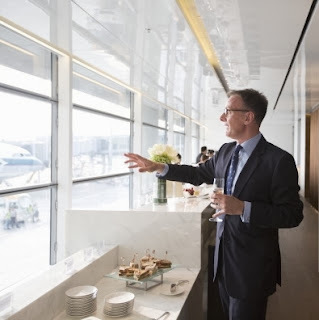 This includes the “distinct possibility” of enlarging the aircraft, perhaps enough to accommodate an extra couple of seat rows, “to sit on top of the 787-9”, said Leahy. The 787-9, at 63m, is about the same length as the A330-300. Leahy suggests that the critical battleground is leaning towards the 300-seat sector, rather than the 250-seat category of the smaller 787-8. 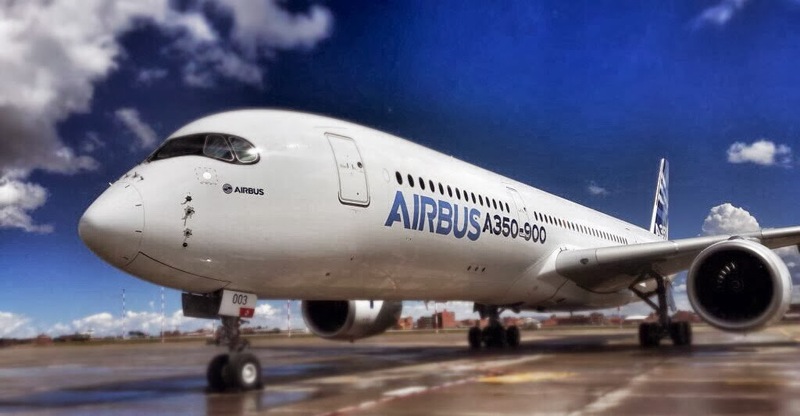 Airbus is still playing down the possibility of re-engining the A330 to compete in the field, although CEO Fabrice Bregier said that re-engining is “always an option for our aircraft”. He said that Airbus has not put a proposal to airlines to re-engine the type – effectively following the A320neo strategy, to create an A330neo – but acknowledged that “some customers” had put the idea to Airbus. “That doesn’t mean we implant every idea from our customers,” he said. 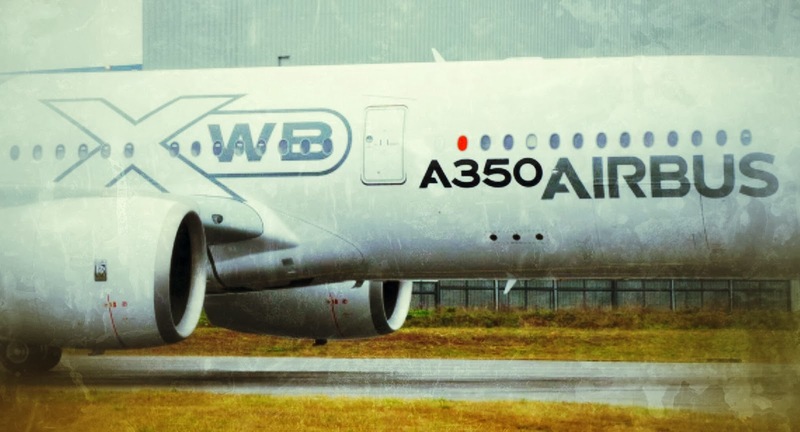 Bregier added that part of the A330’s attraction is its availability, and that a re-engined version would not be available in the same timeframe. Leahy added that General Electric, whose GEnx engine could potentially be used to re-engine the A330, was being “very aggressive” in putting proposals to Airbus, but suggested this is because the engine manufacturer is “surprised” that the A330 is “still going” even after the A350’s launch. GE had been poised to power the original A350 – effectively a re-engined A330, before it was revamped as the current A350 XWB– but has not offered a powerplant for the current A350 range, leaving Rolls-Royce as the only engine option on the family. 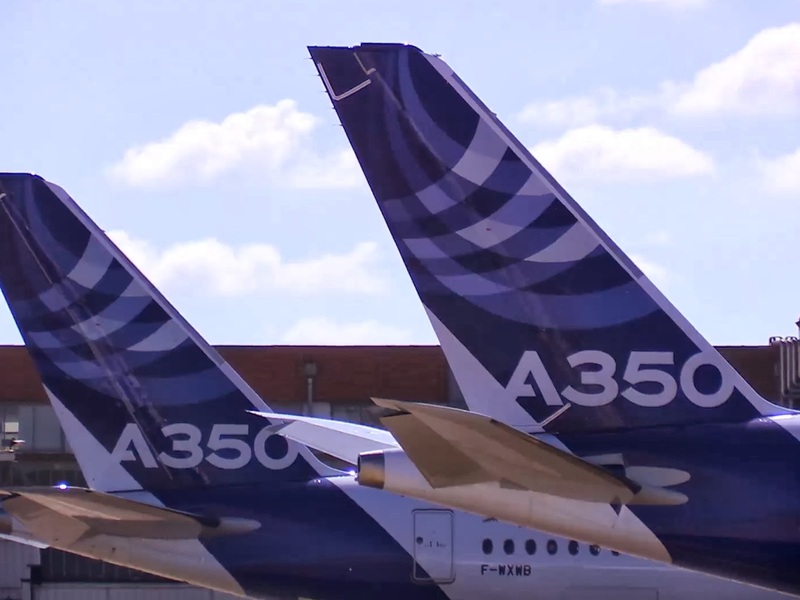 Airbus updates the list-prices for all aircraft; A350-900´s price is 295 million $ and A350-1000´s price is 340 million $, more expensive than their competitors. As usual, Airbus has updated the list prices of its aircraft effective from 1st of January 2014. Airbus has increased the average list prices of its aircraft by 2.6% across the product line as per Airbus’ standard escalation formula over the January/2013 to January/2014 period. Boeing updated the list prices last September/2013.